So the neighbors' plants have finally revealed themselves. In the 5 gallon buckets they're growing cherry tomatoes and in the laundry basket and the container beside it I think they're growing peppers. I originally thought they were main season tomatoes, but the foliage didn't seem right. The old sink remains a mystery. If you enlarge the photo you can see they're using soda bottles to irrigate their plants. They probably bought those watering spikes you screw to the top of the bottles. 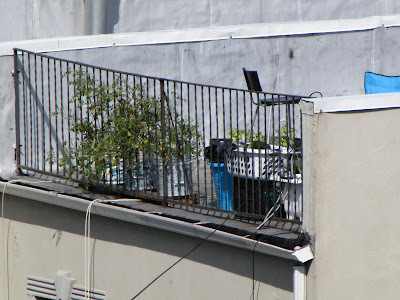 I wonder if they've been able to keep their plants adequately watered, their roof isn't as high as mine, but I'm sure the environment is similar enough. I doubt it's as windy as my place, but those shiny roofs are hot and BRIGHT. Plants will go through water fast in that kind of environment. My previous roof was like that and I suspect the shininess was the cause of my bell pepper sunscald. Next time I'll check up on the Waterpod or the East River, I can't decide who I want to visit first.